Leon Trotsky was a prominent figure of the Communist Revolution, arrested and exiled into Siberia twice during Tsarist days. 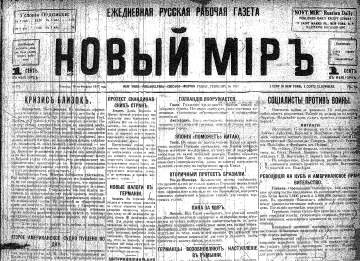 He founded the newspaper Pravda. He was in western Europe when World War I broke out and was deported to the U.S. He returned to Russia after the February Revolution of 1917 overthrew Tsar Nicholas II. By the end of 1917 he was second only to Lenin in the leadership of the Bolshevik Party. 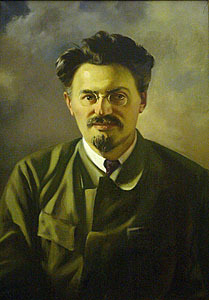 But after Lenin's death in 1924, Stalin portrayed Trotsky as an enemy of the party and sent him into exile. He ended up in Mexico City, where he lived in a very nice home that you can tour today. 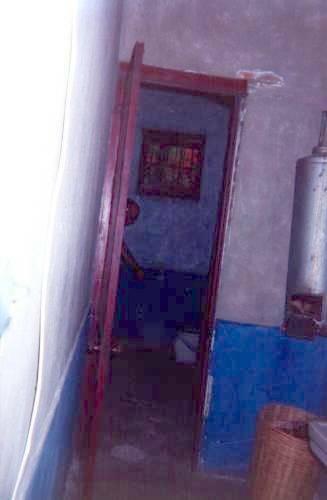 And, of course, I photographed Trotsky's toilet. And his hot-water heater, sink, and tub. He was born Lev Davidovich Bronshtein or Лев Давидович Бронштейн in Yanivka, Ukraine, in 1879. He changed his name during Czarist days to Leon Trotsky, derived from a German term for "defiance". Lenin probably would have named Trotsky as his successor, but Lenin's stroke prevented that. Trotsky was a party theorist, and seems to have been closer to the original intent of Marx than any other prominent Soviet figure. 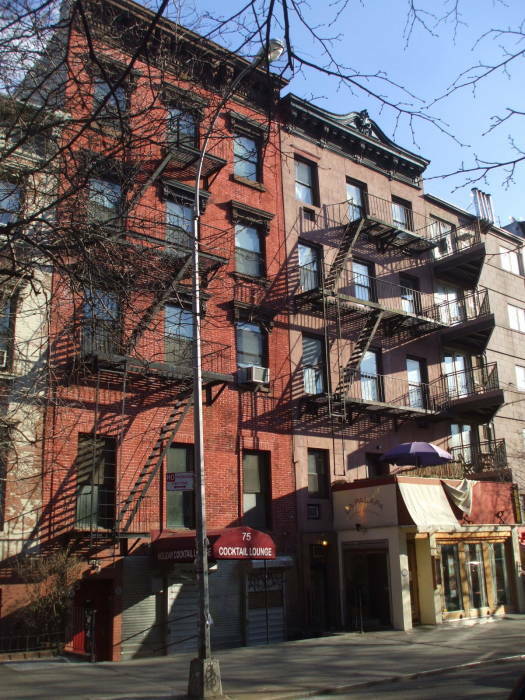 Novy Mir was published at #77 St Marks Place in what today is called the East Village. Today, #77 St Marks Place is the home of La Palapa, a nice Mexican restaurant. #77 is the lighter colored building at right in the picture, the yellow and red extension is the entry to La Palapa. 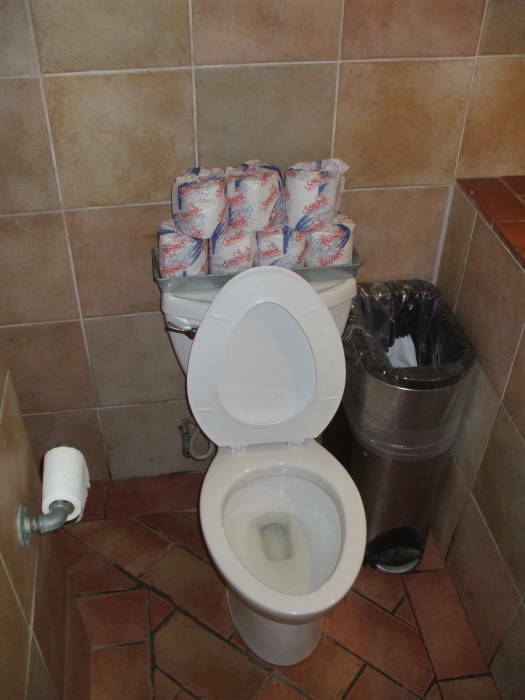 Here we see the restaurant's toilet. Renovations have definitely happened since the days when Trotsky and Bukharin worked here writing and publishing Novy Mir. So yes, unlike those above and below at Trotsky's home in Mexico City, this is just "site of" plumbing. 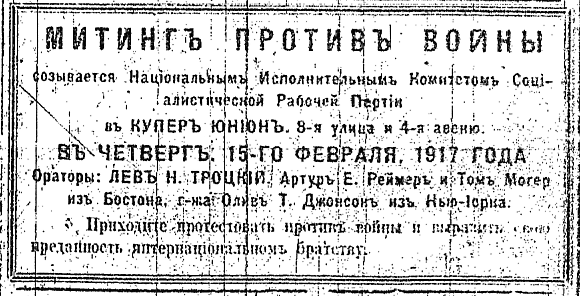 This is an announcement in Novy Mir of a meeting of a group opposing the war. It's to be at Cooper Union, at 8th Street and 4th Avenue, on the 15th of February, 1917. 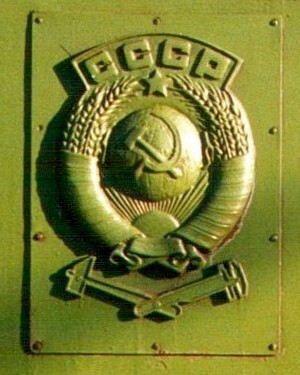 The first "orator" or speaker, listed in all capitals, is Lev N. Trotsky. Today you can tour his home in Mexico City. It's very swanky, click here to see my pictures. The communist leaders may have been for collectivism and "from each according to his abilities, to each according to their needs", but this is a very nice home for Mexico City in the 1930s. 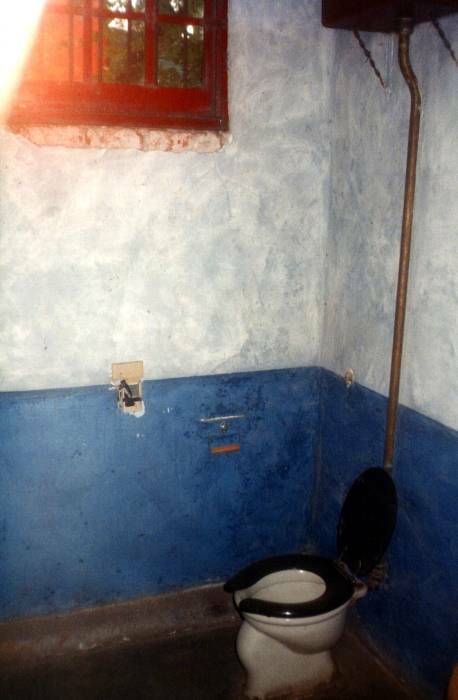 Leon Trotsky's toilet at his home at Avenida Viena in Mexico City, where he lived in 1939 and 1940. Notice how high the water tank is mounted on the wall. This would have had a powerful flush! 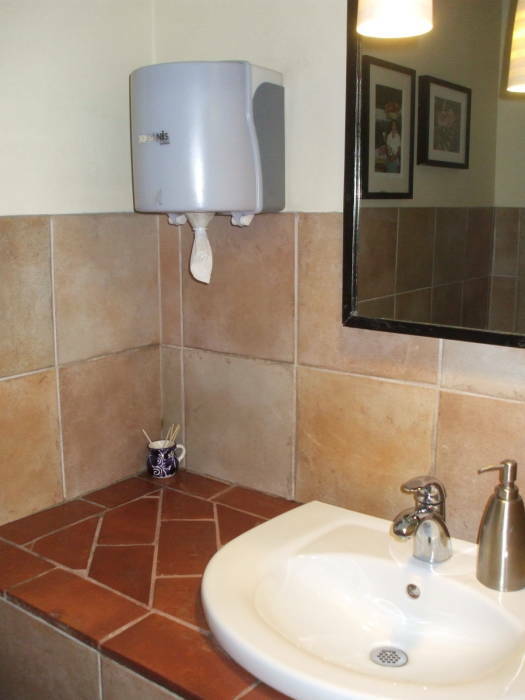 Leon Trotsky's bathroom sink, hot water heater and toilet. Hey, these are my pages and sometimes I include other plumbing of interest like Jim Morrison's bidet or Robert F Kennedy's home water fluoridation system. 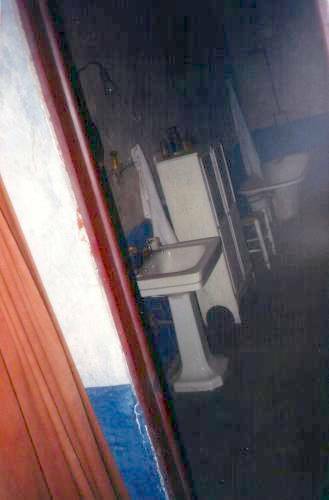 Leon Trotsky's bathroom sink and bathtub. 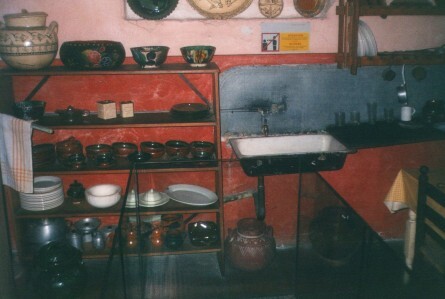 Leon Trotsky's kitchen sink at Avenida Viena in Mexico City. If you are keenly interested in Communist Toilets in general, then be sure to see the toilets of the People's Republic of China.